In the previous parts of this series, we have looked at how our preferences in bicycles changed over time. We started out on “state-of-the-art” bikes with mid-trail geometries, 700C x 28 mm tires and saddlebags. How did we come to prefer low-trail 650B bikes with much wider tires and handlebar bags? And is habituation stronger than optimization? In other words: Do riders prefer the bikes they usually ride, or are there bikes that really are superior, even if they are unfamiliar? Both Mark and I never had cared much about frame stiffness. Then we tested a few bikes with oversize tubing and relatively thick walls. We were baffled by their relatively poor performance. It was framebuilders and constructeur Peter Weigle who suggested: “Maybe those frames are too stiff for you.” After a lot of thinking and even more riding of different bikes, I hypothesized that relatively flexible frames were easier to pedal, because they did not resist our pedal strokes. We could get in sync with the frame, pushing down harder during the power stroke. The frame stored the excess energy as it flexed, and returned it to the drivetrain during the “dead spots” at the top and bottom of the stroke. I compared the phenomenon to a boat rising out of the water at a certain speed – “planing.” At a certain power output, some bikes felt easier to pedal even though I was going faster than before. Mark was skeptical. He was unwilling to give up the belief that frame stiffness did not matter at all. Mark and I both agreed that a classic Columbus SL/Reynolds 531C frame offered a great ride. After all, how could decades of racers be wrong? Both my Singer and Mark’s new bike used those tubes, and we liked these bikes a lot. Then came the first Terraferma test bike (above). It was a racing bike. I didn’t know anything about the tubing. The bike wasn’t particularly light. I didn’t find it very appealing at first, but I was surprised when I felt faster than usual when riding it. 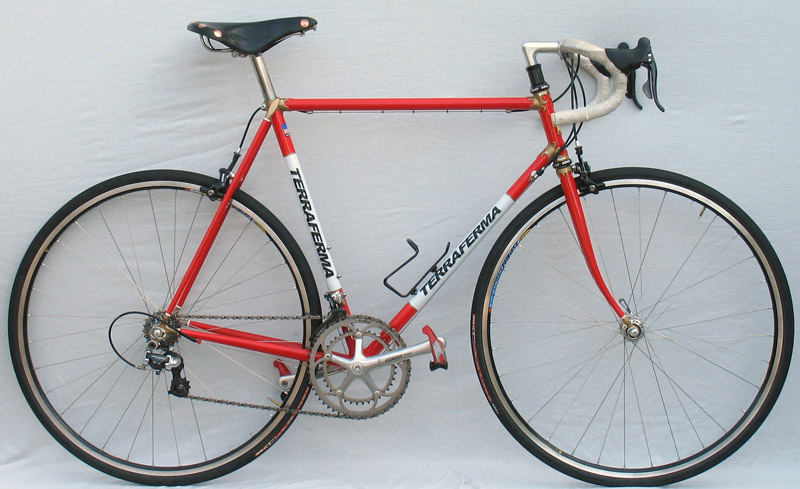 Was there something special about this bike, or did I just have a particularly good day when I rode the Terraferma? To better assess the performance of our test bikes, Mark and I ride a loop around the north end of Lake Washington that has several long, sustained climbs. We usually are well-matched in our climbing speeds. On this day, Mark started on the test bike, while I was on my Singer. I was careful not to let on to Mark what I thought about the test bike to avoid biasing his judgment. On the first long hill, I accelerated in two stages. As usual, Mark remained on my wheel for the first acceleration. When I looked back after upping the pace again, I couldn’t see Mark behind any longer. “Wow,” I thought, “Mark is gone. That test bike is not very fast after all.” Then I realized that Mark was in the blind spot on my other side, passing me. He shifted into a higher gear, and let out a laugh as he accelerated up the hill. Try as I might, I could not catch him. Both Mark and I were faster on the superlight bikes, even though the “standard” bike was very similar to the bikes we had ridden (and continue to ride) all the time. So from our experience, it appears that there is an “optimal” configuration out there. Of course, the optimum may vary depending on what you want to do with your bike. That doesn’t mean that other bikes are no fun to ride. Both Mark and I still have the bikes we ordered in 1999. They still do everything we wanted them to do back then. However, we have found that we can ask much more of a bike than we ever thought possible. Click here to go to Part 6 of this series. – Double-blind tests of frame stiffness and planing, Bicycle Quarterly Vol. 6, No. 4. Been thinking about this. It occurred to me that if planing is as you describe, then your choice of sprockets is going to be a factor. For instance, a 42×21 combination will have the same mechanical advantage as a 30×15, but the latter is going to transmit more force through the frame, presumably inducing more flex. I know that it also takes correspondingly more force to turn a wheel with a 15 tooth cog, but it seems to me that this will have an impact on the phenomenon that you describe. What are your thoughts? I don’t see how there could be a difference in your two set-ups. They both have the same ratio — one revolution of the cranks creates two revolutions of the wheel. As I said in my OP, the mechanical advantage in each case is the same. The *force* transmitted through the frame is different, though. To illustrate: compare a crank with a 42 tooth chainring to the same crank with a 30 tooth chainring. Assume that it’s the same leg pushing in each case, so torque is constant. Torque = Radius x Force, or equivalently, Force = Torque/Radius. The 30 tooth chainring is 40% smaller than the 42 tooth chainring, and thus represents a 40% smaller radius. So the force generated by the 30 tooth chainring will be 40% greater. But, then why are both gear ratios the same mechanical advantage, then? How is it that we would expect to travel the same distance on each bicycle with one pedal revolution? The reason is that while the smaller chainring generates more force, the smaller cog in the back *requires* more force for the wheel to travel at a given speed. For a wheel to roll at a particular speed requires a certain torque, so once again we are holding torque constant. Once again, the 15 tooth cog is 40% smaller than the 21 tooth cog. So the wheel with the 15 tooth cog requires 40% more force to spin at a certain speed than a wheel with a 21 tooth cog. So these two setups have the same mechanical advantage. One pedal revolution will carry the rider the same distance in each scenario. But the 30/15 setup exerts 40% more force on the frame between the crank and the rear wheel. Jan’s planing theory posits that this force acts on the frame much as it would on a spring in the regime where Hook’s Law applies, storing and releasing energy to smooth out a rider’s effort. But the amount of flex depends on the amount of force being transmitted, and that changes depending on your gear ratio. My guess is that a bike that feels too stiff with a 54/27 gear ratio might plane with a 30/15 ratio, but I don’t know for sure, and I would encourage Jan to put the hypothesis to the test. With a smaller chain ring, the chain itself is under greater tension, which means more squeezing/compression of the frame. I suppose if one wanted to be a scientific as possible, one could run a blind experiment by using an internally geared hub with different rings & cogs hidden by a chain case. At first sight, I am not sure this is the case. Yes, the smaller chainring/rear cog, puts higher loads on the chain. However, the lever arm of the chain on the rear hub is smaller, and the same torque/force gets transmitted from the crank to the rear hub. Otherwise, you’d go faster in one chainring/cog combination than the other. And thus, it seems to me that the chainstays get flexed the same, too. Give my explanation to Allan another look — you can’t use torque and force interchangeably, they’re different. My friend Jim has an illustration of the sum of moments around a bottom bracket on his blog here. In any case, it’s a simple enough thing to test, if you have a reasonable selection of chainrings and cogs. The link assumes that the rear wheel does not move – a static load on the chain. However, we have observed that a heavily loaded bike flexes more than a lightly loaded bike, under the same pedaling input. Clearly, how much resistance the chain encounters makes a bit difference, you have to consider the rear cog as well… which, as I see it, cancels out the difference at the chainring. Testing would require an accurate way of measuring BB flex on the frame. I have read and re-read your articles about “planing” a number of times over the years. I am not sure I’ve ever achieved this phenomena, but this post gives me a lot to strive for. Keep up the wonderful writing. Thanks to you, I know why my OS tubing camping bike feels great loaded and rides like a total turd when unloaded! That has been my experience, too – the heavier the bike gets, the more you flex it. The first OS bike with relatively thick tubing walls I tested felt great with a trailer full of groceries (80 lbs.) up a 15% slope. Unloaded, I was less enthused by its performance. When I first read about plaining in Bicycle Quarterly it validated for me that I wasn’t nuts for loving the Vitus 979 frame that I rode back in the 1980s. Have you ridden a bike that you considered too flexible yet? There must be a lower limit for stiffness determined either by handling, performance, or durability. It seems that for ‘standard’ tubes, wall thickness has reached a limit, but the top and down tubes could be reduced in diameter by another 1/8″. Do 7/8″ top tubes exist? On traditional bikes, to our surprise, we found that the most flexible tubes you can buy are just right for us – and we are 6′ (183 cm) tall and not the slowest riders. Our tests indicated that at very high power outputs, there was little difference between the 9-6-9 and 7-4-7 bikes, indicating that in a sprint, for us the optimum stiffness may be in between the two. However, we can maintain that much power only for 15 seconds… At lower power outputs, we preferred the 7-4-7 bikes. Making a bike more flexible than 7-4-7 might be interesting for smaller and/or less strong riders. As you point out, reducing the wall thicknesses further probably isn’t a good idea, so you’d have to reduce the diameter of the tubes. Colnago built some track bikes with “undersize” tubing many years ago, but I know little about them. Some of this is of course old knowledge. My mid 1970’s copy of Richard Balantine’s bicycle book already mentions that frames can be too stiff, and should have the right kind of flex. I think this is what custom builders always tried: stiff enough, but not too stiff, taking into account rider and lugagge weight. For a loaded touring bike I think OS relatively thin walled tubes are an advantage. Make the walls too thin, and the tubes get damaged too easily however. So this is precisely what my loaded tourer has: Reynolds 853 31.75 mm 0.8/0.5 toptube and 34.9 0.8/0.5 downtube. It is perfect for a loaded ride, but a bit too stiff unloaded (but still nice). Standard size thin walled tube may be nice for some, but if you are a bit heavier I think lightly oversized is better: my 1970’s fast bike came with standard sized tubes, and it was great at the time, but now that I am heavier than I once was, it is too flexible. So lightly oversized tubes is what my new fast bike will have. Columbus SL is a thicker tube set than Reynolds 531C, which is closer to the Columbus KL which they only recommended for the lightest riders and TT. I was always confused as to why Reynolds 531C notched up more Tour de France wins than any other tubeset. Apparently it was more flexible and faster! You also have to consider that the Tour de France used to be mostly of national importance. Italian riders focused on the Giro, and French riders focused on the Tour. French riders mostly rode French bikes back then (with notable exceptions), and French makers mostly used Reynolds 531 at least until the 1970s. For some reason, French makers vastly preferred the British Reynolds tubing to French tubing from Vitus, Durifort and other makers. Jan, I’ve always appreciated your empirical approach to challenging conventional wisdom on bicycling equipment; but I’m wondering how far one can generalize from your investigations on more flexible frames being faster. Your data seems fairly specific to your and Mark’s body types and cycling preferences, and it would seem possibly a stretch too far to use this data to conclude anything about, say, criterium racing, with its constant explosive accelerations, and finish line sprints, or about riders with significant variance from you and Mark in weight or body type. When I first started racing as a junior ( 150 lbs, 5’9″, I rode a Colnago Super built by Ernesto himself–truly a superb bicycle. I found it highly competitive. By the time I was in college I had bulked up a bit and grown (180 lbs, 6′), and found the Colnago more limiting in sprints and accelerations. I switched to a Rossin–the main difference from the Colnago being thicker seat stays–and with my more sprinter-like build in college, found it easier to win criteriums on the Rossin. The Rossin seemed better coupled to my intentions at full gas–it felt like I needed to work less hard to jump off the front of the Peleton and to be able to stay there. The only difference from the Colnago appeared to be that the Rossin had less horizontal and vertical flex. Given that plenty of people ride centuries as if they were in the Tour, and that among amateur riders, there would be significant variances in body types and power output, I would think there’s a need for a more objective benchmark than what you’ve labeled “planing,” and/or the personal riding experiences of two guys who are tall and relatively thin before concluding that the personal data for you and Mark would apply to enthusiast level riding in general. I don’t mean this as a critique, only as a possible refinement. You are absolutely right. We were very careful not to generalize when we concluded that “superligth” 7-4-7 tubing in standard diameters worked best for us. I doubt that our preferences are shared by everybody. In fact, there is a reason that Reynolds 531C and Columbus SL were so popular for so long among racers – in an all-out sprint, these somewhat stiffer frames appear to work better for strong riders. We try to encourage people to think about these things, not to tell them what to ride. (You’ll never see a “Bike of the Year” or “Test Winner” in Bicycle Quarterly.) We provide information, but our readers have to form their own preferences. This is interesting. I’ve had a Miyata 215 for a number of years. All the moving parts on it were getting really worn, and this fall I came across a Miyata 610 which had been completely upgraded and restored. The biggest noticeable difference between the two is the seat stays on the 610 are considerably thicker. The chain stays are also about 2cm longer. All the rest of the tubes are the same diameter. I don’t know if there is a difference in wall thickness. The bike has been a bit of a disappointment. I can’t spin on it the way I can on my old 215. I’ve wondered if the heavier seat stays are part of the problem. The other thing which never occurred to me until Michael Wolfe’s comments above is that I have the 610 set up as a 1×9 with a 46 chain ring. The 215 has a 28/40/50 triple in front and I always ride in the middle gear unless I’m going down one of the larger hills here Portland. I’m not a big guy (ahem 130lbs), so the smaller seat stays and smaller chain ring on the 215 may account for why it seems to feel considerably better to me. And to be complete, I can’t rule out the wheels, which are considerably heavier on the 610, or the saddle, which is wider. I’ve wanted to swap them but the rear wheels have different spacing and the 610 has a generator hub wired in. So it’s going to take some doing. The saddle, I just haven’t got around to swapping. what effect would stiff components have on planing/flexibility? An external bottom bracket crankset is arguably more stiff than, say, a vintage TA crankset. If one were to install the latest Dura Ace crankset on a super light steel tubing frame, would planing be reduced? Seems like it’s not just the frame/fork tubing that would have an effect on riding performance and feel. That is a good question. From our experience, it seems that cranks, BBs, etc., flex very little compared to the frame. When we were in the wind tunnel, my collaborators observed how much the bottom bracket shell of my bike (made from middle-of-the-road Reynolds 531C tubing) moved from side to side. If aluminum cranks flexed nearly that much, they would break. If your bottom bracket spindle flexed that much, your bearings would bind… However, without more testing, we cannot rule out that components do make a difference. And you might be able to design components that do offer some flex, perhaps even adjustable, similar to the rear triangle of the Trek 2100C we used in some experiments of planing.. I suspect there is great variability in the extent to which cyclists sense this phenomenon. I am 5’7, 125lb, and not an aggressive cyclist. Yet I felt the same sensations you describe in the articles on planing almost as soon as I began riding roadbikes. Some bikes had it, and some bikes didn’t, and the ones that had it felt “better” and enabled me to go faster. Eventually I learned to stop mentioning it to others, as everyone thought I was being ridiculous. But to me it’s quite real and reading about planing in BQ was a great “I’m not crazy!” moment. There are ways to devise a study that would address the issues of sampling, generalisation, etc. that some (myself included) have raised, and would statistically demonstrate that X% of cyclists do indeed experience planing. But to me, that is not necessarily a study worth conducting. We already know that some cyclists experience it. What’s more interesting to me is a deeper understanding of the phenomenon itself, which can only be accomplished via continuing to analyse subjective experiences of those who do feel it. Great post, buy I would postulate that instead of using the term ‘planing’, what you are actually describing is hysteresis. The upside as you describe, is that you can truly store energy if the pedal strokes are uneven, the downside being that you lose some of that energy given the process itself. In addition to bike comparisons, one could also compare riding styles. Not to delve into racing, but I have read somewhere that a higher cadence (rpm @ the crank) smooths out the pedal strokes and a more rigid frame may suit that type of rider. A slower cadence with greater variation in torque in the pedal stroke may favor the less rigid frame. We used the term “planing” because we don’t want to give the impression that we know exactly what is going on. If we used “hysteresis” and later found out that other factors are more important, we’d have to change the term, creating great confusion. “Planing” describes the phenomenon, allowing for multiple explanations of the underlying physics and biomechanics. Riding style plays a role, no doubt. Both Mark and I spin at relatively high cadences (110 rpm), which may be why we prefer relatively flexible frames. A rider putting out the same power at 80 rpm might do better on a stiffer frame, because they put more power into every stroke. However, we must remember that smooth pedal strokes are relative – most of the power has to come from the downstroke. In fact, I have heard of a study that showed that professional racers had the same pedal stroke as amateurs, except that they pushed down much harder on the pedals. So in effect, the stronger the racer, the less even the pedal stroke. Does anybody remember that study and have a reference for me? First of all, it’s been a delight to stumble onto your blog, and I’m enjoying reading through the back articles. You are doing us all a great service with your writings. Regarding “Part 5 – Frame Stiffness”: I was wondering if you have any thoughts on how frame stiffness might interact with steering geometry, and also on whether some frame bending/torsion modes might matter more than others in producing the benefits you describe. The backdrop to my query is that, among the bicycles I’ve spent time with, the one that most did what you’ve described was my very first road bike — a late-70s Peugeot PX-10 (purchased new while in high school). This bike has a fairly whippy 531(c?) frame, and even now when I pull it out (still with original components! ), it accelerates up hills better than anything else I’ve ridden (though as a small boat sailor, I don’t find the sensation at all akin to planing; to me, it’s more “dancelike” in that the bike dances and weaves lightly uphill with each pedal stroke). Had the PX-10 remained the most flexible bike I’ve ever owned, I’d have supposed that simple frame flex (tuned to the weight and power of the rider) might be enough to produce the planing/dancing sensation — but in college I had a similarly flexible frame, in the form of a mid-80s Trek 400 “sport tourer” (531c again, but in a larger frame size), and this bike never did anything even remotely dancelike or planing-like. It was pretty much a slug uphill — but it did possess one quality that the PX-10 never showed: on hard bumpy downhill corners (big smooth New England frost-heave bumps; the kind that can bottom a car’s suspension without pinch-flatting a narrow bicycle clincher), the frame would sort of “wind-up” and then “unwind” with enough force to throw a rider a couple of feet off the cornering line (in terms of sensation, it was sort of a “WHANG!” and suddenly you’d be almost off the road). For this bike, frame flexibility seemingly had no virtues, and at least one awful demerit — and yet my equally flexy Peugeot shows only virtues. 1) Though I’ve never measured it, my PX-10 has “eyeball” dimensions that make it seem closer than my other bikes to the low-trail randonneur designs you’ve described elsewhere: compared with my long-gone Trek and my current Mercian and Condor (all 1980s 531c frames), the Peugeot seems to have a noticeably steeper head angle, larger fork rake/offset, shorter front center, and longer chainstays (and it is, after all, French!). The Mercian has a particularly slack head angle (perhaps 72 degrees), and it doesn’t dance at all; the Condor’s a nominal 73 degrees (though it might be a bit steeper), and it’ll dance a bit if I really stomp hard out of the saddle — but as the PX-10 is far and away the dancing king, I’m wondering if the “French” geometry is somehow complementing the frame flex, and thus producing the dancing sensation? When the Peugeot was really flying uphill, it would weave in a way that seemed effortless — perhaps the natural frequency of the steering response was matched to the load/unload cycles of the frame? Would that be possible? My apologies for such a long-winded “comment”, and I’d be interested to hear if you’ve any thoughts on steering+stiffness interactions — if it turns out that “French” front geometries work well with whippy frames, then that’d be pretty neat! P.S. — Elsewhere on your site you say that low trail works best with wider tires; my PX-10 is of course on narrow sewups, and at the end of a long training ride (particularly when exhaustion mixed with frigid cold), it was often hard to ride in a straight line. If only your blog had existed way back then!! Perhaps the stories about superlight bikes being scary during descents indicate poorly chosen front-end geometries, and the superlight tubing simply brought those deficiencies to the fore, whereas they might have been masked on stiffer bikes? I’m skeptical that the flexing frame returns any power to the rotating crank, since I see the frame flex as only a side effect (!) of the crank movement. The frame moves side-to-side because the cranks are not in line with the centerline of the bike; their q factor works as an invisible lever that forces the frame sideways. Because this force is applied simultaneously with the down force on the rotating crank, we are tempted to see them as necessarily related. I don’t think that they are. Rather, I suspect that it takes very little energy to keep the frame flexing at certain frequencies, so that under optimum conditions, energy loss due to frame flex is negligible, and gains due to regulation and dampening of the pedal stroke are real.